We’re very happy to announce our continued collaboration with Team 17 Digital and are excited to be able to share this news relating to our recent work on Superfrog HD! Superfrog HD will hop on to PS Vita and PlayStation 3 at the very end of July for £6.49/€7.99. It will be a cross-buy title with 24 new levels alongside the 24 original levels, a level editor and an endless runner mode. 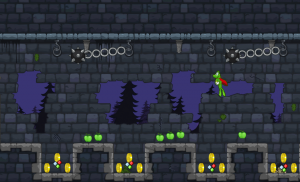 Superfrog HD is also coming to PC. Mac and Linux in due course.